Hap Scrappy: Happy Birthday Mom! I have not posted anything recently because of course ..Christmas happened...but more importantly..I vowed to never make another card until I completely reorganized my craft room & purged a lot of product at the same time! Although I probably vowed to do the same thing the last 2 years, I really meant it this time and did not make or send out any cards since that last post. I am happy to say I made a lot of progress, but still have a lot of work to do. However I could not disregard my mother's 86th birthday. She will turn 86 on this Monday January 16th, and I have made her birthday cards for about the last seven years at least, so I couldn't disappoint her!! Purple/Lavender is her most favorite color of all times....it has not changed over many, many years! I know first hand & have a constant reminder. My husband & I bought her & my dad's house about 16 years ago. Our master bath tub is lavender as well as the sinks, and there are strategic bath tiles of lavender in both the shower & on the tile floor. Her next favorite color is rose, and that is the color of tile & fixtures in our second bathroom!! When they sold us their house, they moved into a condo and my Mom proceeded to paint the bathrooms & walls there in lavender & rose...who'd of thunk!! We have not been able to remodel the house since we bought it due to economic woes & I think when my mom visits from time to time...that's just fine with her!! Anyway...enough storytelling..here is the card I created for her....oh...I forgot to say...butterflies are another one of her passions!! I have never used these butterfly stamp & die cuts before, and sadly, I cannot even tell you where I got them from. I'm sure I probably purchased them with my Mom in mind!! I colored them with my Promarkers & then added some shimmer with a Wink of Stella marker, and added a few Pretty Pink Posh clear droplets! Well...sorry I ranted on too much, but thanks for listening & I hope you like my card & I thank you for stopping by!! A lovely card for your Mom! The butterflies against the script are a wonderful combination! Thanks for playing along with us at the Simon Says Stamp Wednesday challenge! Love your fabby card, Great colours together and nice design. Thanks for joining my bling challenge over at PFP last week. Nice card, love the colors and layout. Thanks for joining ABNH! Well done, you! 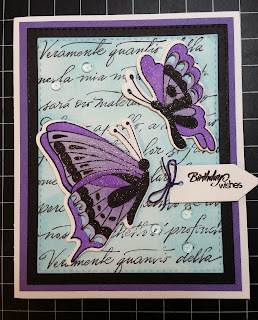 I love cards with butterflies, even though I can't seem to make them work for me. Ha. Thanks so much for joining us at A Blog Named Hero!